"You know very well--the wine from the hills of Anjou." "Yes, I know what brand you are talking about." "Well, in the absence of champagne and chambertin, you must content yourselves with that." 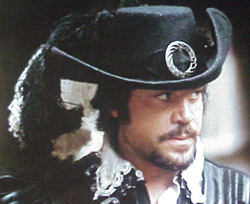 Apparently Athos would rather have some fine bubbly Champagne or a grand cru from the Cote d'Or in Burgundy rather than this Anjou. Which is good, since as it turns out, it was poisoned by M'Lady. What is this stuff which would have lured the Three Musketeers to their doom? Anjou is in the western end of the Loire Valley , with its primary town being Angers. Anjou white wines were well known in the 12th and 13th century, made with Chenin Blanc and Chardonnay. In the 16th and 17th centuries the Dutch began to promote the sweet white wines from this area. Since the arrival of phylloxera , almost a third of Anjou is planted with Cabernet Franc. Grolleau and Cabernet Sauvignon, and Gamay are also planted in this region. In recent years, Anjou has diluted its reputation and produced mostly mild rose wines. Still, its Cabernet Franc wines have great potential and should be watched for. Despite its current red tint, in the days of the Musketeers Anjou was known as a fine place to find white wines. Follow in the footsteps of the brave Athos. While he appears to favor a bold red or brisk sparkling wine, he is still fond of these whites!